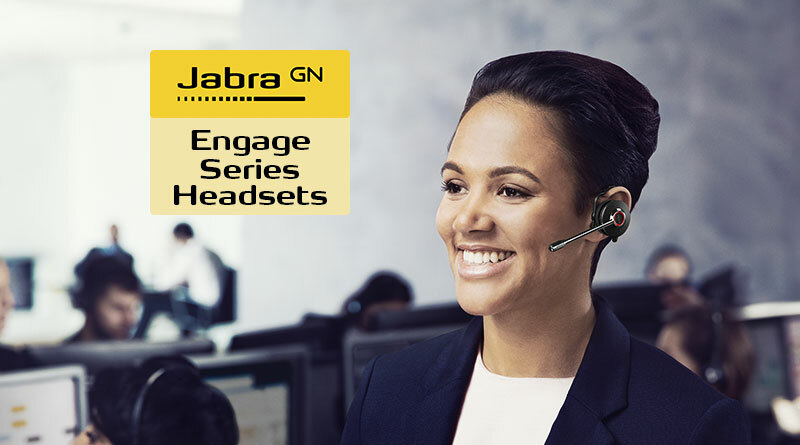 Jabra Engage is a brand-new series of wireless headsets from Jabra GN that sets the standard for business communications. 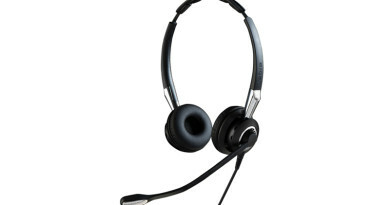 Designed for the modern office, the Engage headsets are both powerful and stylish. With the Engage series, Jabra has adapted the DECT communications protocol to support three times the density of wireless headsets in one space, an absolute must in today’s offices, where the wireless spectra are increasingly packed. Engage headsets let you wander a football field and a half away from the headset base. And with AES 256-bit encryption and 128-bit authentication using DECT Security Level C, your communications are secure. 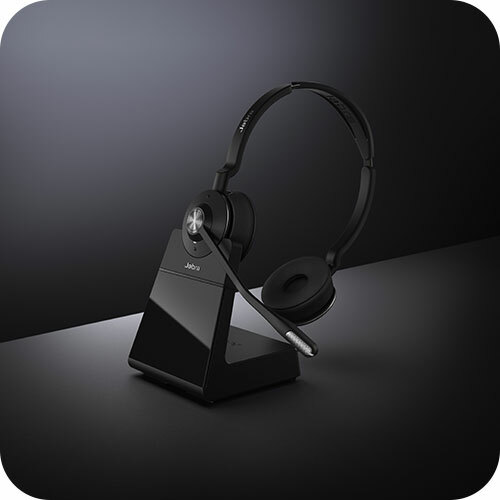 If you’re looking for a professional IP phone headset or a wireless softphone headset that meets Microsoft’s Skype for Business Open Office standards, check out the new Jabra Engage series. 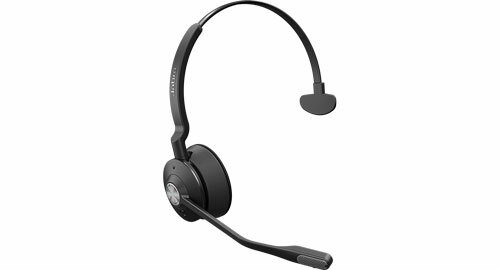 Jabra Engage comprises two models, Engage 65 and Engage 75, with options for monaural or stereo audio with a headband, or a featherweight monaural headset with a convertible earhook. The compact base station that connects to the deskphone or computer has an elegant touchscreen for the Engage 75 and easy-to-use button for the Engage 65. It provides a convenient storage cradle and charges your headset, including fast charging: 0% to 40% in half an hour. The audio quality of Jabra headsets has made them incredibly popular for business around the world. For efficiency, they support narrowband audio. But they also support music-quality audio with a specific music mode. The audio is optimized for the office. The directional microphones provide noise cancellation. Engage headsets include intelligent volume control, which normalizes speech levels to a user-defined level so no voice is too loud or too quiet. They also feature ear-protecting technologies: PeakStop, Noise@Work, and Acoustic Shock. Let’s get a bit more specific. Incredible wireless range — never worry! Jabra Engage Mono and Engage Stereo headsets have a wireless wander range of 490 feet or 150 meters. That’s a whole football field plus another half. 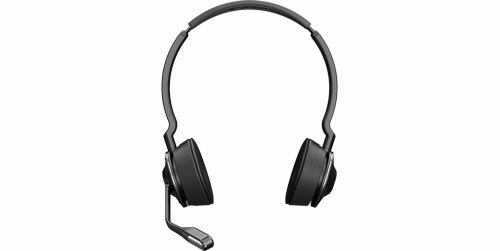 And the light as a feather Jabra Engage Convertible headset has a range of 330 feet or 100 meters. Of course, these are in ideal circumstances, but even in a busy office, you’ll be able to walk where you want without worrying about connection quality. Every user agrees: wireless is wonderful. But when the wireless spectra get too busy, wireless signals start to degrade. 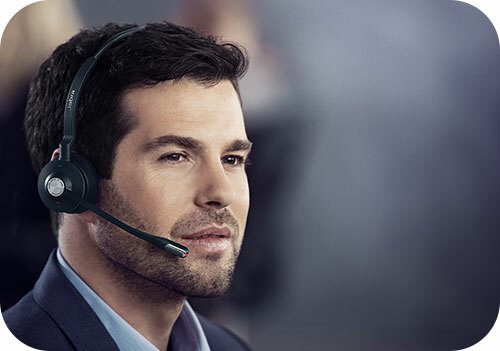 Jabra Engage headsets allow up to 130 headsets in narrowband audio mode or 80 headsets in wideband audio mode to operate in the same space without any loss of connection quality. For open offices, where the wireless traffic gets so complicated, Jabra Engage are the perfect solution. Every headset has an integrated BusyLight on the headphone and the tip of the microphone as a visual do-not-disturb signal. And this doesn’t affect the incredible battery life. Engage 65 Mono and Engage 65 Stereo offer 13 hours of talk time on a single charge. Engage 65 Convertible offers 9 hours. If you forget to place it in the charging cradle overnight, don’t worry: with a standby time of 52 hours (32 for Convertible), it can last a long time without a charge. Jabra includes PowerNap technology to extend the standby time even more. PowerNap kicks in when the headset has not been docked or moved and is not in use for 30 minutes. The Jabra Engage Convertible models are the lightest DECT headsets on the market today, weighing only 18g. They come with earhooks and EarGels for either ear, so you can wear it how you want. Engage 75 Convertible also comes with a headband and a neckband that you can switch out for more wearing options. Take everything we just told you about the Engage 65 headsets. Now add Bluetooth 5.0 connectivity, an extra Micro USB connection, and a touchscreen base station: you get Jabra Engage 75. The Jabra Engage 75 base station comes with Bluetooth 5.0 support. Bluetooth 5.0 is the latest version of the wireless standard. Compared to the last version, it increases how far data can be sent, how fast that data can be sent, and how much data can be sent. For users, that means better communications when used with other devices that support the new standard. Note that it’s the base, not the headset, that supports Bluetooth and connects to other devices. This gives you the simple connectivity while letting your headset retain all-day battery power. Bluetooth also increases the number of simultaneous connections that Engage 75 can handle. 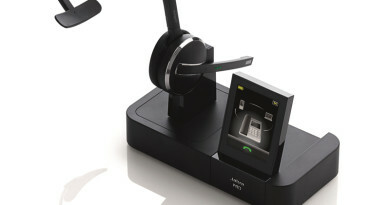 The Jabra Engage 75 base station has an extra Micro USB port and Bluetooth. 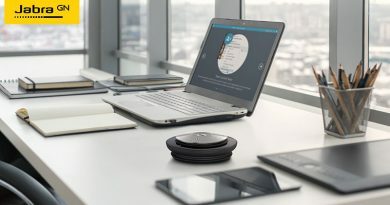 This means that you can connect to 5 devices at the same time: two USB options (like softphones or deskphones), one analog phone, and two Bluetooth mobile devices. Versatility, power, convenience: Jabra Engage 75.